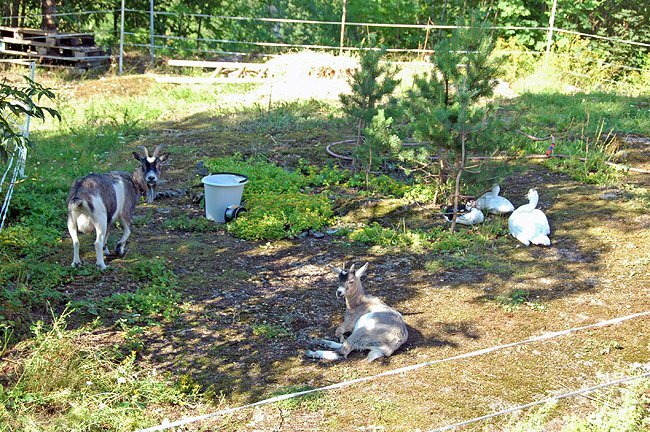 Welcome to The Goats’ Garden! We get so many visitors from around the world! If you come for a look around the site, please do follow us so you can see what is happening in Norway and here on the farm- just click the ‘follow’ button at the top of the page and you will be alerted of any new posts. Also, please don’t be shy- leave a comment and let me know who you are, what you are interested in, and what has brought you here. Click ‘leave a reply’, at the end of the page. I would love to get to know you! The Goat’s Garden is a labor of love in an arctic climate. When we bought this house three years ago, all that we knew was that we fell in love with it. 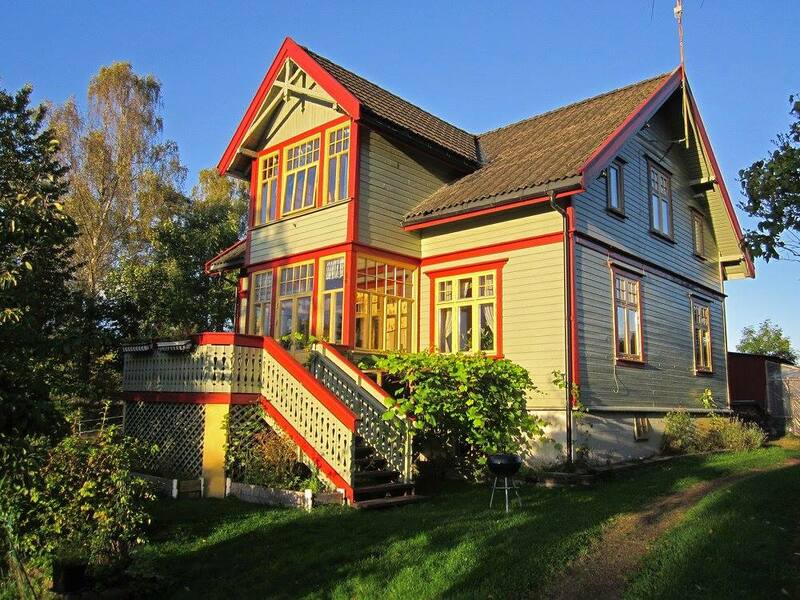 Built in 1930 in Norwegian carpenter style, the house sits on two acres of brush, timber, lawn, and farmland. When we first stood at the window in the living room and looked out over the west facing fields, David said, ‘I can’t wait to see a sunset here’. Over the past three years the home and the land have been the canvas on which we have slowly but steadily painted our dreams. An organic kitchen garden, first, then some chickens. We built a greenhouse and planted tomatoes, hot peppers, cucumbers, kiwis, and figs. We added apples, plums, cherries and goji berries to the pear and peach tree. We added blueberries alongside the blackberries and raspberries. We grow quinoa and yacon, fava beans, pumpkins, corn, peas, beans, beets, carrots, kale and chard, salad greens and spinach and masses of lavender, roses, echinacea, and more. And then came the goats. It had always been a dream of mine to have goats. Living in Cyprus we saw goats herded past our house. I chose African dwarf goats for their loving disposition, their smaller size, and their milk giving capabilities. Dina and Lucky were mama and daughter; Lucky at first so shy and wild she would not let anyone near her. In 2013 Izzie, Kara and Ajla, their offspring, were born. In 2014 our lovely grandma goat, Dina, died suddenly but naturally on a warm autumn afternoon. She was a beautiful soul, and we still miss her greatly. We subsequently sold Lucky and her daughter Ajla, and are now in the process of breeding our two girls, Izzie and Kara, who are now one and a half years old. Both are beautiful and friendly souls who love meeting new guests. My name is Bea, a Y12 International Student taking the Environmental, Systems and Societies course. I am very interested in ecofriendly bed and breakfast; I think it is a brilliant idea. May I ask a few questions? 1. Is the energy used 100% renewable? If yes, what is the source of power being used? If no, how much percentage of the energy is renewable? 2. Is the food served grown by your gardens, or locally produced? 3. Do you have any educational programms the costumers can take part in? 4. How much of your resources do you reuse? 5. How much percentage of the waste do you recycle? I need the results for the class Environmental Systems and Societies, if my article is published, your business could be beneficial Please, participate! I’m counting on you! Hi Bea, you are asking alot of questions for for me to answer in this small space- do you want to send me your email address, or email me at katharinestavrinou@yahoo.co.uk, and I can write in more detail. In general, we are on the grid, so our energy is not 100 percent renewable, but we subscribe to a renewable energy plan, so some of it is. The food served is as local as possible and all organic. 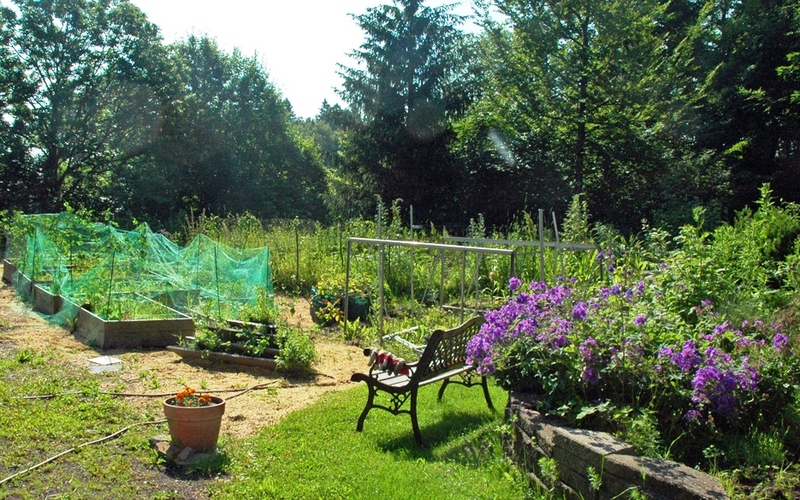 We belong to a farmshare, we buy from our local organic grocery, and we grow our own. There are often programs in the area, it depends on when people come. We try to reuse and recycle as much as possible. I have a flyer based on permaculture principles I can send you. We sort and recycle everything we can, compost, and recycle from the goats to the garden and back again. Again, I can write more by email. A very beautiful place. I’m so very happy to hear you are living your dream! hi, found your page while looking for garden advice for my daughter who recently has moved to a lovely traditional house near Aurscog. She moved to Norway 3 years ago from Scotland and till now has not been interested in gardening! Her house location is beautiful, on the edge of the forest, but unfortunately is built on a rocky little hill. When I visited recently we planted alpines and wildflowers which seem to be growing ok but we are unsure about which plants might grow well in this situation. She would like a border with flowering perennials similar to our garden in Scotland but I don’t know if this is possible. Any advice would be good. I did enjoy reading about your beautiful place. Hello Connie, Thank you for your comments! It is hard to give much advice without seeing the place. 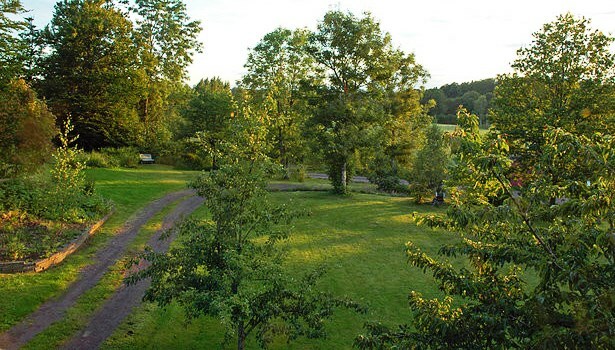 I have training in permaculture and am learning more and more about perennials in Norway, but each location is different. What kinds of flowering perennials do you grow in Scotland, and where in Scotland are you? I have recently planted a perennial garden with ramsløk, a garlicky herb, horseradish, tuborous peas, and sorrel around the already growing rhubarb, løvstikke, comfrey, and hablizia, which is a perennial caucasian spinach, but as you see, I am more involved in planting edibles. We have poppies, which are perennial, and many different bulbs here, as well as roses of course, and flowering bushes. I would advise your daughter to visit a good plant store near where she lives as they will stock the types of plants that grow best in the area. I know what you mean about rocky soil- ours was very rocky, and we have worked on it over the years by adding hay from the goat yard and horse manure from the neighbors’ farm, as well as liquid compost made from stinging nettles and comfrey. If you daughter or you are in the area you are more than welcome to come by and visit! We are near Glasgow on the wetter warmer West Coast side. Just about anything except the most tender grows here. Wind and rain are our main problems. Daughter’s garden has no great depth of soil and it must be very acidic because she is literally at the edge of the forest. Pots and raised bed is the plan. They get pretty cold winters as they are an hour east of Oslo but nice warm summer April to October was warmer and dryer than Scotland. Soft fruit and wild flowers did well as did the alpines and rockery plants so at least that’s a start in her first year. So great your post : Our aim is to offer an organic abundance to those who visit us. We offer organic towels and bath products, ecologically friendly bedding, and all organic breakfasts along with other meals as desired.